In a recent *highly* scientific (read: Instagram) poll, when given the choice, 60% of you said you’d prefer to get more meal prep ideas rather than weekly menus. I’m still toying with weekly menus (trying to figure out the best way to make them easily accessible and convenient), but meal prep ideas? Those I’ve got ready to go. 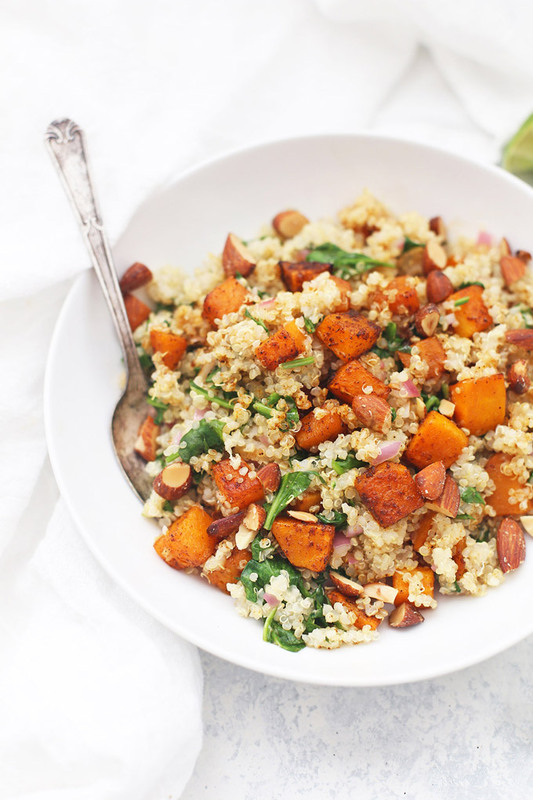 Take this Squash Quinoa with Smoked Almonds. It might sound like an interesting combination, but it’s the kind of dish I never really get tired of. It’s got so much going for it–protein, veggies, big flavors, and plenty of crunch. 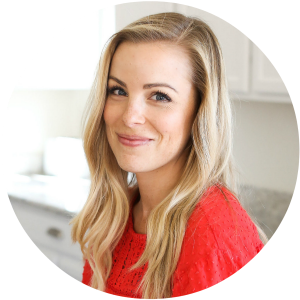 It’s so satisfying for an easy dinner and makes a TERRIFIC meal prep lunch. The big star here is the smoky flavors. Michael, who is usually fine-but-mostly-“meh” about quinoa and not really into squash, RAVED about this one. (“It’s like barbecue without the grill!”) The big star is the roasted squash with smoky flavors. 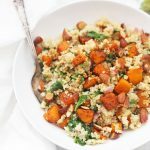 It gets caramelized and tender in the oven, and brings most of the flavor to the rest of the salad, which is pulled together in no time once the squash and quinoa are cooked. I love that the warm quinoa has just enough heat to cook the red onions (which takes the bite out of them) and wilt the spinach. When the squash is stirred in and the crunch of the almonds is sprinkled on top? Fuhgettaboutit. So good. I’ve eaten the leftovers cold and warm and like it both ways (Michael prefers his warmed up). For lunches throughout the week, I pack it into meal prep containers with the almonds stored separately from the salad in one compartment and some fruit in the other. Right before serving, I sprinkle the almonds over top and dive right in! Pack it for Meal Prep! This packs well in meal prep containers (these or these are my favorites). The only thing I do is save the almonds for right before serving. I either tuck them into one of the side compartments, a little jar, or small bag on the side, then add them on top after re-heating the leftovers. I also like to store a lime wedge with each portion to squeeze on after re-heating, but that’s just a personal preference. Let’s talk almonds. I love using smoked almonds for this. They taste smoky (because they’re, you know, smoked) and have an almost barbecue taste, which is so nice with the veggies and lime. If you’re looking for a natural brand, Almond Brothers is the best one I’ve tried (I get them at Sprouts). If you can’t find/don’t want to use smoked almonds, I recommend using toasted almonds, which also lend a gorgeous toasty flavor to the dish. I just stir them regularly in a dry pan on low heat for 5-10 minutes until they start to smell delicious and get a little color. Smoked Paprika. Smoked Paprika might seem like a specialty ingredient, but it actually gets quite a bit of use in my kitchen, from Salsa Verde Chicken and Rice Soup, to Beef Carnitas, to Spicy CRISPY Oven Fries, to Deviled Eggs and more. A little goes a long way, but it’s such a nice flavor! I recommend not skipping it. If you need to or want do, you’ll probably want to add a pinch of cumin or some additional chili powder to compensate. In a medium bowl, stir together squash, olive oil, chili powder, smoked paprika, onion powder, garlic powder, and salt. Stir until squash is well coated in the spice mixture. Spread seasoned squash out onto a baking sheet. Roast squash at 375 degrees F for 25-35 minutes, or until tender and caramelized. While the squash is cooking, cook your quinoa. Heat 2 cups of water in a medium saucepan until boiling. Add rinsed quinoa (I rinse mine in a fine-mesh sieve). Reduce heat to a low simmer, cover the pot and continue to cook about 15 minutes, or until liquid is absorbed and quinoa is tender. When the quinoa is cooked, remove from heat and stir in lime juice, red onion, and baby spinach. Cover 4-5 minutes and allow the spinach to wilt and the onion to soften. When the squash is finished roasting, stir into your quinoa mixture. Right before serving, sprinkle with almonds (and cilantro, if using). Leftovers will keep at least 4-5 days in the fridge. If preparing for meal prep, store almonds separately from salad so they remain crunchy. I like to pack mine with an extra lime wedge to squeeze on each portion. Pack it for Meal Prep! This packs well in meal prep containers. The only thing I do is save the almonds for right before serving. I either tuck them into one of the side compartments, a little jar, or small bag on the side, then add them on top after re-heating the leftovers. I also like to store a lime wedge with each portion to squeeze on after re-heating, but that’s just a personal preference. Let’s talk almonds. I love using smoked almonds for this. They taste smoky (because they’re, you know, smoked) and have an almost barbecue taste, which is so nice with the veggies and lime. If you can’t find/don’t want to use smoked almonds, I recommend using toasted almonds, which also lend a gorgeous toasty flavor to the dish. I just stir them regularly in a dry pan on low heat for 5-10 minutes until they start to smell delicious and get a little color. 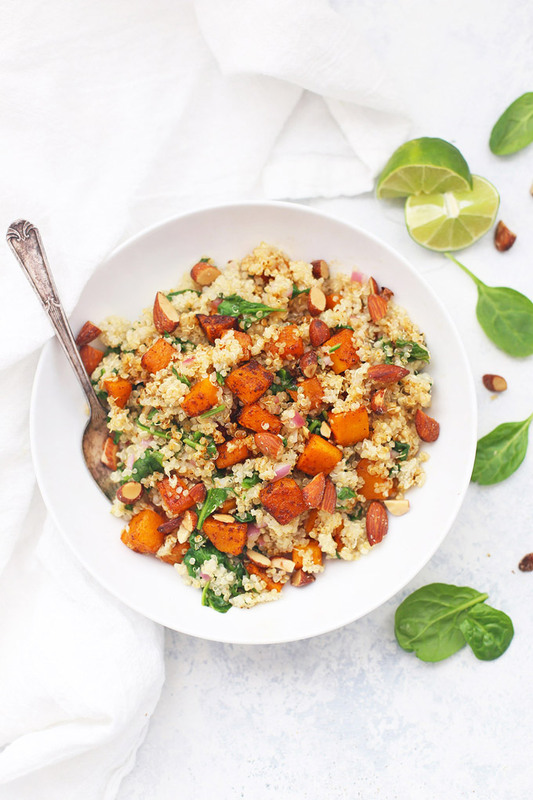 Do you have a favorite brand or style of Quinoa? When I look in the grocery store there is so much to choose from, I don’t know where to start. Ellen – I’ve had great luck with a lot of brands, so you probably can’t really go wrong. Bob’s Red Mill is consistently good, and the Costco Kirkland brand is another reliable one. I’ve also tried Ancient Harvest and TruRoots with great results! Thanks for the heads-up! I’ve had good results with other Bob’s Red Mill products, so I’ll probably start with them. I’m all about the smoked paprika! I recently discovered it and I don’t think I’ll ever use regular old paprika again. Have you ever used red quinoa or a tri-color blend??? I gave up on quinoa a few years back because my fam didnt like the softer texture, but the red and tri color quinoa have a firmer, chewier bite. Love it! I have! I love all kinds of quinoa, but Michael actually hates the chewiness of the rainbow/red. So funny how we all have our own preferences! Question!! This looks delicious! Could you use brown rice instead of quinoa? 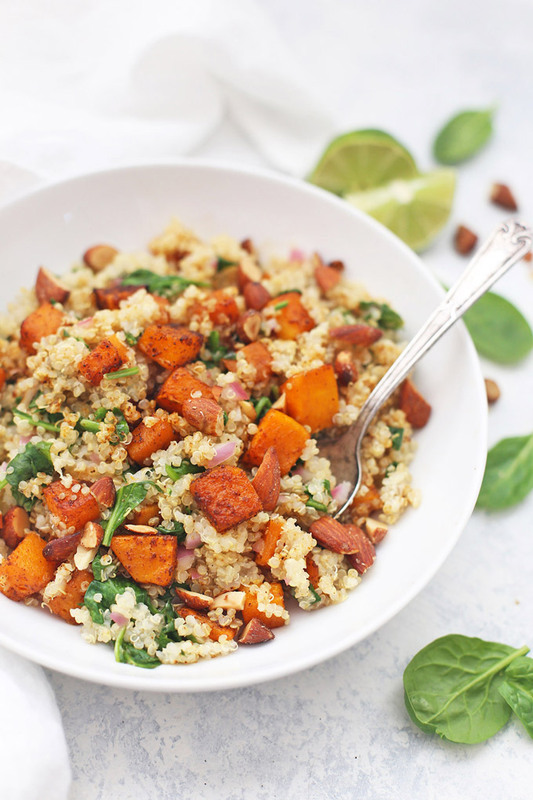 Could you use sweet potatoes instead of butternut squash? Just if you wanted to change it up some? Olivia – I’m sure that would be delicious!